"Endgame" is over and a whole new era for the Dark Knight begins. We sat down with Batman writer Scott Snyder to see if we could get a small peek behind this very different cowl. It’s been quite a ride, but with yesterday’s BATMAN #40, Scott Snyder and Greg Capullo’s Joker-and-Batman-as-legend storyline “Endgame” has come to its end. The title would certainly seem to be an apt one judging by how the issue ends, and yet, with a new issue of Batman out in June (and an original Batman short story in DC’s Free Comic Book Day offering, Divergence), Batman isn’t going anywhere. In fact, Batman’s never been more exciting, unpredictable or relevant. Batman has never been more alive. With so much taking place right now within the Batman family of books, and with Snyder and Capullo’s Batman reaching a turning point, it only made sense to sit down with Snyder for a brief chat on Batman, the expanded family of books and why you should write every Batman storyline like it’s your last. We’re currently finishing up “Endgame.” Where do things go from here with Batman? Any small teases of what we can expect? What I can tease you with is this: the Bat landscape has become something that is intensely inspiring to me and Greg. The new books that have come, the new take on Batgirl, Gotham Academy, Gotham by Midnight—all the books that are beginning in June as well, it’s become so vibrant. I feel like fans have resoundingly responded to change, risk and to bold storytelling with cheers, with this welcome, exuberant response. That has really changed creators’ perception of the fanbase across the line. I can tell you, talking to creator after creator here at DC, we all see it. The zeitgeist has changed, and so for us, this story really means burning everything down and starting something. This was the story where I remember first thinking [it would have to be] completely out of continuity because it’s so wacky, and then I realized that “Endgame” actually sets it up perfectly. It’s something that is going to change the status of Batman in every book that has Batman in it. It really is a game changer, this one, in a big way and I hope you guys like it as much as we do because it is definitely the wackiest thing we’ve ever done. As someone who’s been involved with the mainstream comic industry and with Batman for quite a while, how important are titles like the new Batgirl, Gotham Academy, Black Canary, and even Gotham by Midnight? How important is having that sort of diversity, in your opinion? I think it’s hugely important. I think it reflects the changing audience entirely. Audiences today don’t want what they’ve historically wanted, which I think are recombinations of classic character match-ups and fanboy moments. They still want those things, and those are great things, there’s nothing against them at all, but I think some of us have grown up as writers and artists in an environment that’s become increasingly excited about transformative or transgressive stories; stories that are more progressive with characters. What it seems like fans want is for a creator to come on to a character, have tremendous respect for that character and the core values of that character, but do something that is visionary or singular and does the kind of passionate take on the character that is reflective of that creator’s work outside of licensed work in their own creator-owned world. So having books like this is just a referendum on that. I feel like it’s a huge point of pride for us, me and Greg, being on Batman right now and being a part of the DC lineup when it’s so incredibly diverse. I think there’s a book for almost every taste. That was [Senior Editor] Mark Doyle’s mission: a bat book for every fan and for every taste. I was like, that’s perfect. With a book like Batman, that has obviously been going for quite a while, I’m curious—how do you write a series like this, which you have been writing now for years, and still have it accessible so that brand new fans can just pick up an issue and start reading? That’s a great question. It’s definitely a priority of ours to make every arc sort of singular. I know some people write continuing series that are sort of cumulative, where every arc sort of leads to the next arc. I’m not really built that way. I’m sort of wired to write an arc, it’s done, I move to the next one. So each one is designed to be a big point of entry for readers. The two priorities I have on a book are to make sure you approach every story with the outlook that if it’s your one chance to write Batman, ever, this would be the story that you would write. That’s my compass with Greg, and we agree on that 1000%. The second thing is to make sure that every arc you do can be picked up by someone who hasn’t been reading the others and they can get right on board with it quickly. You just make sure you try and keep in mind every comic is somebody’s first comic, and they might just come in and pick up BATMAN #41 and that might be their introduction to Batman, so it had better be something that welcomes them and makes them feel like they are part of the fun. I do know! I’ve seen them, so I can tell you, these new books… Pat Gleason’s Robin: Son of Batman is so fun. There’s Goliath, this giant man-bat creature that Damian is friends with, and it’s almost like this sort of crazy adventure and quest book. We Are Robin, Lee Bermejo’s book, is incredible. It imagines that these kids in Gotham take up the ‘R’ to honor the mantle of Robin, but also to change Gotham. It’s an incredibly contemporary, immediate, urgent book and it’s wonderful. Black Canary by Brenden Fletcher and Annie Wu, it’s rock and roll fun, it’s out there. James Tynion’s Dark Universe with Ming Doyle, that book, I’m telling you, it does things with these magical and mythological characters that you’d never expect. It really is book after book. It’s not hard to be a champion of these comics when they are that good. One after another! I’ve been critical of DC when I felt they weren’t being progressive enough, or the books were in the wrong direction, or editorial was too involved, all kinds of stuff like that. I can genuinely say this is the most excited I’ve ever been to be part of this company and I’m proud to be part of DC. The books they’re putting out are really good. They’re really diverse, and they are really a response to fans making wonderfully exuberant sorts of demands for us as creators, and we want to say thank you to them because they are creating seismic shifts in the way comics work. 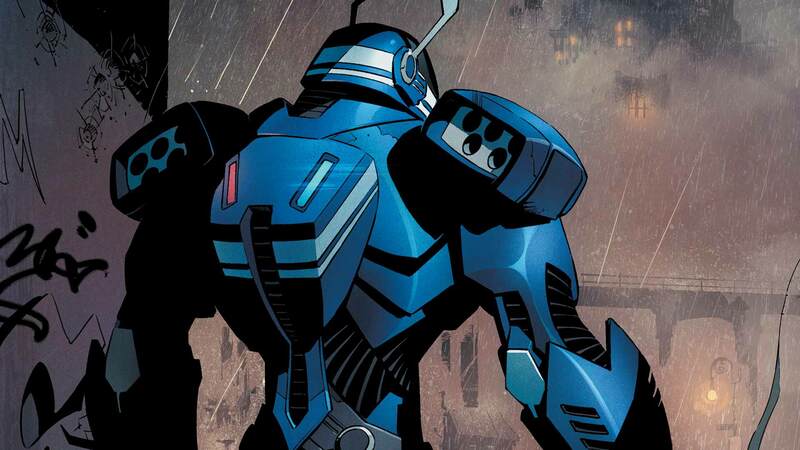 Have a question for Scott Snyder? He’ll be having a special Twitter Q & A tomorrow, Friday, May 1st from 2-3 p.m. EST (11 a.m.-12 p.m. PST). Ask questions using the hashtag #BatmanChat, and follow @DCComics on Twitter for his answers to your questions. Meet Scott Snyder on Free Comic Book Day! He’ll be signing books at Fourth World Comics in Smithtown, New York from 10 a.m.-1 p.m. Click here for more information.